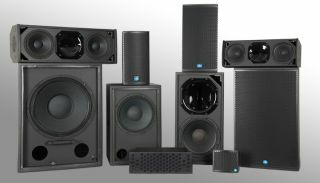 The What: Renkus-Heinz has launched the C Series of professional loudspeakers for installed sound applications. A reinvention and evolution of the company's CF/CFX Series, the C Series is designed to meet the needs of today's installed AV professionals, with a broad range of systems to provide effective solutions for every sound reinforcement challenge. Designed for permanent installed applications, C Series loudspeakers are a cost-effective solution for theaters and performing arts spaces, houses of worship, multi-use venues, public spaces, and any project where quality sound, high performance, and superior pattern control are essential. The What Else: The C Series loudspeakers incorporate the latest generation of Complex Conic Horns, with updated drivers to provide clean, natural sound, and tighter pattern control. Unlike conventional loudspeaker designs, Complex Conic horns provide consistent beamwidth over a wider frequency range, with the natural, transparent sound that Renkus-Heinz is known for. And as with all Renkus-Heinz products, C Series loudspeakers are backed by Renkus-Heinz's worldwide customer support.